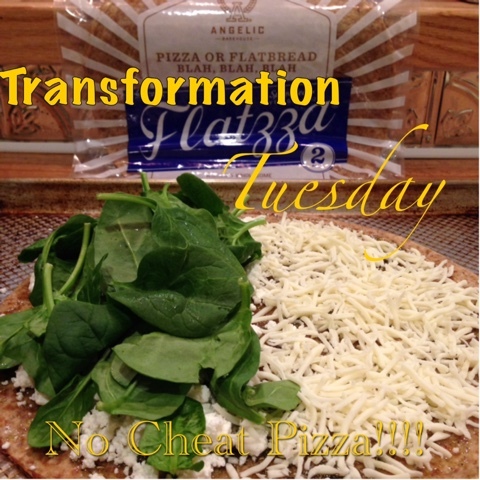 For Transformation Tuesdays I plan to share a clean-eating recipe, workout and fitness tips and tricks, or part of someone's transformation story. I scrapped my original plan for today when I made pizza this weekend. In an accountability group I've been in for the past few weeks, I've become known as "Chef Amanda" because I'm always coming up with something! I've always enjoyed cooking, and while I don't create many of my own recipes I'm always finding creative things to do in the kitchen with the base of a good recipe. But this pizza? Other than the crust I feel like this simple one was fairly original to me! If you follow the 21 Day Fix nutrition guidelines, pizza is an allowable cheat on occasion. But what if it didn't have to be a cheat? Recently I discovered these amazing pizza crust/flatbread creations by Angelic Bakehouse that are marvelous. They're called "Flatzza" and I came across them using HEB's app while trying to add sprouted bread to my shopping list! Now, if you are into hand-tossed, stuffed, Chicago style pizza (I'm with you those are delicious!!) this won't fix that craving. You'll have to save a cheat for that. But because this is whole-wheat and sprouted grain, it doesn't have to be a cheat! I count 1/4 a pizza (or two slices if you do eight slice pizzas) as one yellow. Yippee! You can make your pizza and eat it too! Which is good news because these are quick and easy, and they come two to a pack so I always freeze the second and know that there is an easy meal I can throw together at the end of a difficult day. Saturday I opted for a goat cheese and spinach (for the adults) mozzarella pizza (for the kids, they used to enjoy goat cheese but something changed and they joined Uncle Nathan and GiGi's team). But the possibilities (even when eating clean!) are endless! Instead of spending a purple container to have a tomato sauce, I made a dam of Italian herbs and poured 4 teaspoons of extra virgin olive oil in the middle. I used a spoon to mix and spread it evenly across the surface of the crust. Then I sprinkled two blue containers of goat cheese over half the pizza, and "enough" mozzarella over the other half. Mozzarella would be fix-approved too! Then I heaped two green containers of spinach over the goat cheese. Really the possibilities are endless! Sliced tomatoes (bruschetta/margarita pizza anyone? ), mushrooms, really any veggie you would put on a pizza. What a delicious way to get those greens in! These bake a 400 and you just keep an eye on it until it is to your liking (I think it was 8-10 minutes for me). Thin crust pizza in a few minutes. Happy, healthy family. I love these Flatzza sanity savers! In the end I counted my two slices of spinach and goat cheese pizza as 1 yellow, 1 blue, 1 green, and 1 teaspoon!